The dreaded down turn in Oil and Gas Industry is here with us once again. For some rigs, stacking, whether warm or cold stacking is unavoidable. During this period when the rigs are stacked, pre-stacked benchmark visual condition records would be beneficial for a number of reasons. One of the benefits is to assess the pre-stacked condition against the re-activation period to see any appreciable deterioration, changes in condition of mothballed internal environment or work space outside subjected to environmental condition. While bidding for the contracts when the rigs are in stack mode, it is also beneficial to extract the 3D photographic records of the drilling and supporting services and work space such as engine room, mud treatment facilities, drill floor, etc. to aid the process. In recognising the supports that our customers have diligently provided to us throughout our cooperation, we at Rig Engineering are pleased to supply 3D Photographic records of the pre-stack condition at no cost. We would however, request that accommodation and meal be provided to our Surveyor in return, including travel cost to and from our Aberdeen Office to your stacked rig. If you or your colleagues find this offer of free services beneficial for your Rig Asset Management, please get in touch with us so that we can make this free offer of services work for you. Below is an example of such a records where a portion of the rig is illustrated below. 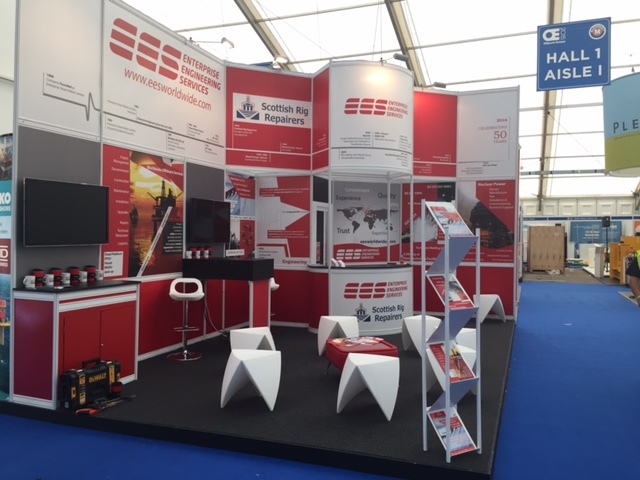 Video of our Alliance partner Enterprise Engineering Services in action at Offshore Europe 2015. The Enterprise Engineering Stand can be found at Stand 1J48. 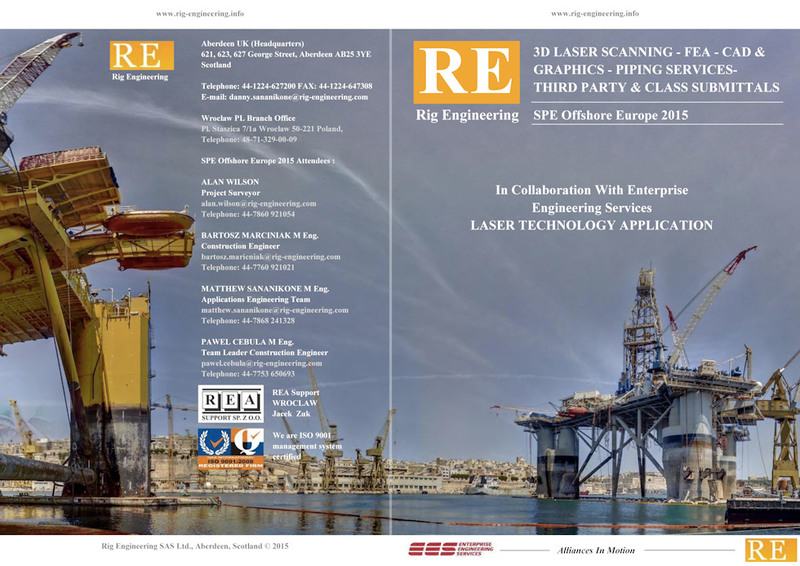 Rig Engineering marketing representatives will be attending SPE Offshore Europe 2015 alongside alliance partner Enterprise Engineering Services. We have provided flyers along with demonstration videos showcasing work flow from “cradle to grave” using laser scan technology in support to our alliance EES and highlighting other complementary engineering services. Enterprise Engineering Services can be found at stand 1J48. If you are unable to attend Offshore Europe, please see these items below. A wellhead re-entry guide cone will be integrated in to an existing BOP for well intervention in the upcoming program. Neither of the components come with certified dimensional drawings to which engineering detailed design, analysis and fabrication can commence. This video therefore traces the start of the engineering process through to the end point of the work flow life cycle i.e. from “cradle to grave” to allow for the optimum design process to be realised. Laser scan cloud data for both components as well as Christmas Tree was carried out using 3D colour laser scanning technology. Once the guide cone was modelled In 3D CAD environment, detailed design to suit functional requirements was carried out and followed by Finite Element Assessment to simulate the response of the proposed design when subjected to impact load – stabbing in to the well head mandrel. To keep man-hours and cost to a minimum, only the new part in CAD is modelled and this allows direct porting back in to the cloud without modelling the offshore environment in to expensive 3D CAD normally deployed by other design house. Clash check using data from Offshore Operations Personnel has been used to simulate the path from BOP set back area over to the moon pool location where the head room is reported to be most critical. Video walkthrough charted this path to allow Project Team to do the “dry run” ahead of the operation itself. Physically accounting for all deck penetrations allowing for preparation and implementation of zero discharging of any liquid discharging overboard using Ship Yard As Built (SYAB) alone, is fraught with problems and uncertainties. Firstly, the As Installed information of deck drains, scuppers and opening rarely find its way back to the previously Approved For Construction Drawings (AFC) and secondly, adding or relocating or blanking off deck drains / penetrations are routinely done to assure deck is kept dry. 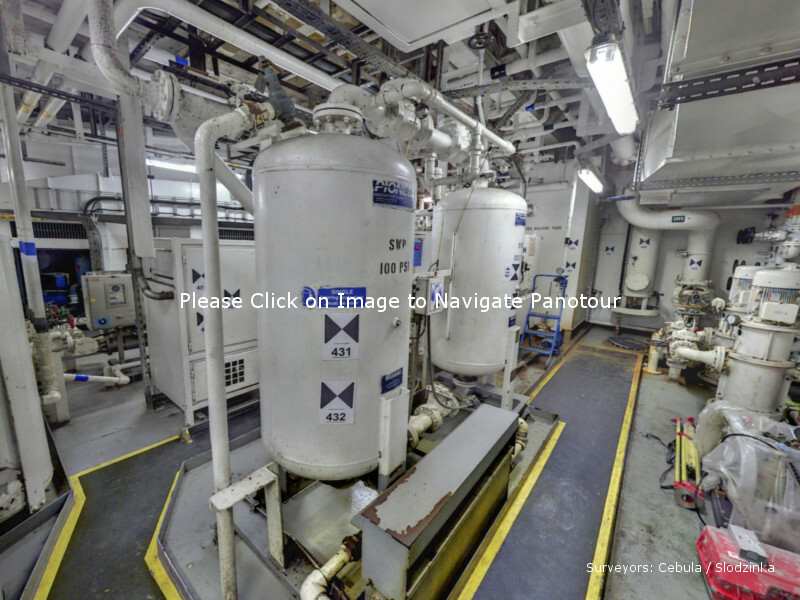 As such, to meet MARPOL’s requirements, Rig Engineering has accounted for all deck opening using 3D colour laser scanning technology. With the captured cloud scan, spool piece, tie ins, pipe supports and candidate hangers for scaffolding during installation can be pre planned, well ahead of the vessel arriving for the actual installation. In this real life case study, a series of colour laser scan were done from under deck on the pontoon to identify all the openings that are detectable and forms part of the manifolding system to collecting tank on one of the stability columns of the vessel. This can then be discharged at suitable interval as required, to supply vessel and offload to shore side. Scale drawings in 2 or 3D of mechanical components and piping system rarely formed part of Ship Yard As Built Drawings (SYAB) when the vessel was delivered. Most of the time, only schematic drawings existed just to allow for the shipyard to install Owner Furnished Equipment (OFE) and incorporate in to the Ship Yard provided connecting pipe work. Subsequent maintenance, modification and upgrade is fraught with lack of dimensions and spatial arrangement information to allow for the visualisation of the installation and maintenance space around the components to be replaced. Rig Engineering routinely laser scan the candidate area and conduct reverse engineering and produce a 3D spatial arrangement in the laser scan cloud in a ready state to receive new / proposed components. Using today’s drawing package norms of CAD or 3D component object, the planned system / space can be populated with all the components necessary to make the new system work. 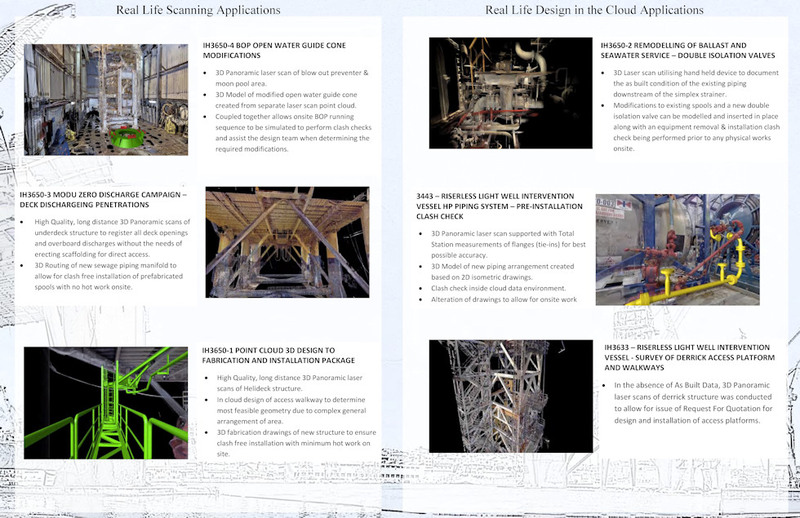 A virtual walk around of the planned installation inside the laser scan cloud, can be done quickly to unearth any installation problem well ahead of cutting POs for all the components to make the modifications works first time.